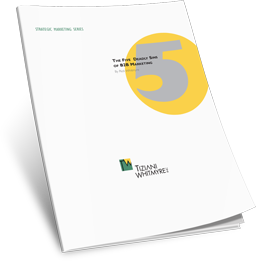 This paper explores the requirements for embracing and internalizing the revenue generation approach, and outlines the five steps that create a framework for process implementation. You will learn how to evaluate organizational competence, plan the transformation, and execute the plan. This paper reviews the benefits of a new revenue generation process that fulfills the need to acquire and nurture prospects in ways that are easy to deploy, measurable, and compatible with present marketing practices. The paper explores how the process offers exceptional benefits across the buying cycle — from lead acquisition to sales conversion — when embraced by the organization and executed successfully. The paper reviews how the revenue generation process builds initiatives around business outcomes, not marketing activities. It explores the way B2B marketers can blend process with technology to continually drive revenue in a highly measurable way. B2B marketers will be confronted by new opportunities too great to be ignored. We see five trends that will offer exciting potential for those who harness their power. At Tiziani Whitmyre, we're aggressively leveraging these new directions to support our clients' marketing programs. Today's marketers require an easy-to-implement process that employs powerful internet-driven technologies to accelerate lead acquisition and increase conversion into sales. This paper outlines a highly measurable, strategic marketing process called ROI Marketing. The process embraces the B2B prospect’s thirst for knowledge by using content marketing as a way to stimulate prospect response. It is organized around a four-step framework: Acquire, Nurture, Measure, Optimize. B2B marketing is a difficult game. Faced with shrinking budgets and daunting competition, we search for new and creative strategies to take our brands to market. Sometimes, along this journey we lose our way; we make mistakes. Every marketer worth their laptop has committed some blunders. And from these failures came great learning experiences. We explore these marketing blind alleys in this white paper.